Truth be told, my exciting project for the year is not on the UFO list. It is new (begun in November) and slow. It is hand piecing and fussy cut and complex, so a lot of time is spent picking fabrics, cutting and prepping the pieces before I work. 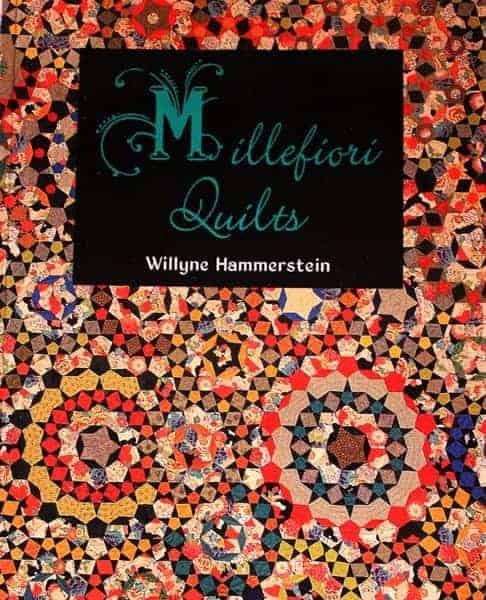 It is based on the book Milliefiore Quilts by Willyne Hammerstein and is a gorgeous quilt. The cover quilt is the one that I am working on. There are Facebook groups and pinterest pictures of different versions of this quilt, which makes it even more fun. I have completed one round and love the process. I am still trying to figure out if I love the way that I am doing the English Paper Piecing. I am using glue, which makes one part of the preparation just zip along. I started using the 3/8″ templates, but am using the templates with the 1/4″ seam allowance as I find the 3/8″ seam allowance too much for the smaller pieces. I have gone through a variety of threads but am now using mettler embroidery weight thread with thread heaven for my piecing. It nearly disappears and I have many fewer problems with it than with the others I tried (Bottom Line, Masterpiece and Aurifil). Right now I am using a stitch called “the flat back stitch”. There are many explanations of the stitch, but you can see a video here at DIY addict. I am now on my second rosette and enjoying the process a bit more. I think I have gotten more comfortable with the pieces and the flat back stitch. 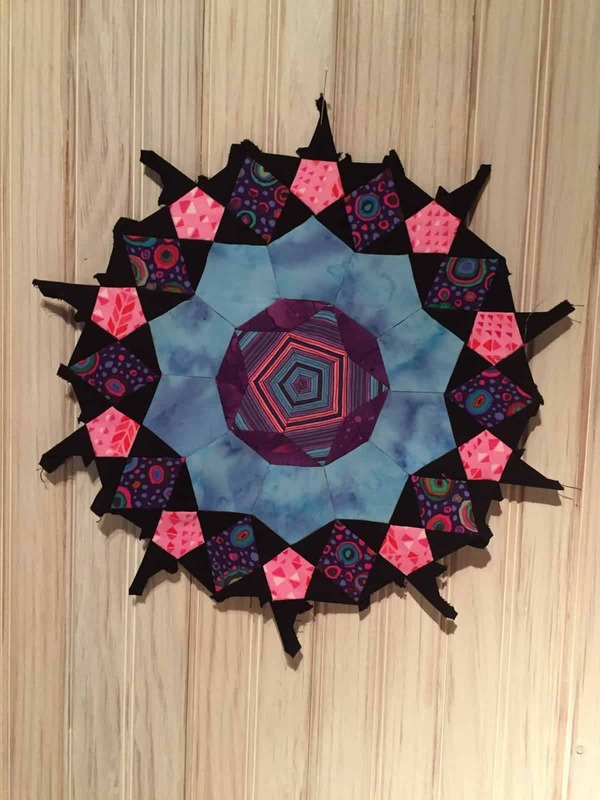 There are two Facebook groups for the Millefiori -La Passacaglia quilt and one for the New Hexagon Book-Millefiore group. They are wonderful resources for learning more about the process. I’ll post on this as I complete rounds. My plan is to make a smaller quilt and I think I have narrowed the size on the layout page. I will soon figure out exactly the rounds I need to and make more plans for this fun quilt. It’s exciting to begin something like this and I am enjoying the planing process. To say that I’m nervous about completing the edges would be an understatement, but I have plenty to do before I get there, so I am not focusing too much on that (ok, maybe that’s a lie).